Hundreds of years in the future, Jacob, chased by the alien warrior race of Lan'khamires, is off the grid, searching for a mysterious woman named Phoebe who once helped him many years ago. His love for her has never faded and, in vain, he continues to look for her. Traveling from the moon to Mars while being hunted, Jacob only knows that he must find the woman he loves no matter the cost. Meanwhile Phoebe, Cinderella's daughter and a powerful witch like her mother, searches for a cure for her mother's mysterious illness. A rare Chronicler able to travel through time, Phoebe left the 19th century only to become trapped far in the future. A future in which humankind has not only traveled to distant stars by discovering the Jovian Gate, but she has also become embroiled in a conflict between the peaceful Cancrian race and the warrior-like Lan'khamires. Out of her element and time, Phoebe stumbles upon an interstellar conspiracy that threatens not only her life and those around her, but of the entire human race. 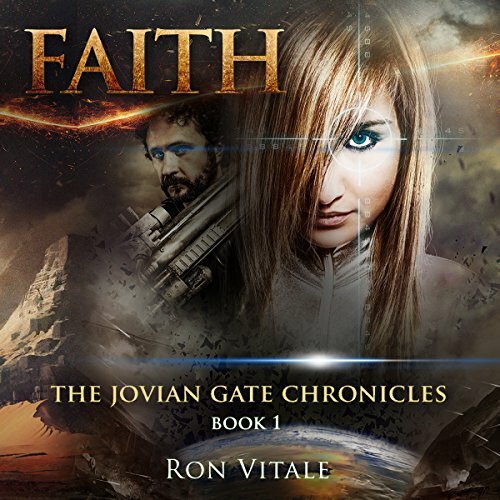 Faith is the first book in The Jovian Gate Chronicles series. I got a little confused with some of the alien types, though maybe reading some of the previous books might help with that. What about Jessica Mann’s performance did you like? It was a fairly good reading, light-hearted with a sense of humour in places. I wasn't sure about a couple of the accents though. This is futuristic science fiction with lots of aliens and interplanetary travel. Phoebe has somehow ended up in the future and needs to get back to 1821 with a cure for her sick mother. She's on the run, being tracked by more than one faction and doesn't know who she can trust. But she actually is actually a witch and has plenty of power herself. Meanwhile, Jacob has been trying to find her for years. He met her when he was younger and is in love with her, he just knows deep inside he is meant to see her again. I was left hanging a bit at the end but enjoyed the epilogue. I enjoyed this book very much . The characters were easy to like and the interaction between the characters was interesting. I would recommend this to anyone who would enjoy distopian landscapes and magical beings.